When you are considering building your own home, you will need to look into construction loan rates instead of mortgage loan rates. Very few lenders will extend a permanent mortgage on a home that has not yet been built. The construction costs and final value of the home are too uncertain for this financing structure to succeed. You will likely need to take two separate loans: one for construction and one for your permanent mortgage. This can result in significant risks to you. Mortgage loans are extended based on the value of a piece of collateral: the home you are purchasing. When you are building a home, that collateral is absent. A mortgage lender cannot obtain security against a loan large enough to purchase the entire construction of a home. As a result, you will need to get a loan first to build the home. This can be a construction loan, a bridge loan or another type of temporary loan device. It is extended based on the value of the property itself, and it covers the cost of the initial construction costs. During the life of the loan, regular inspections can take place to estimate progress on the building and evaluate the new value of the property. The value will go up after each step. It rises after the yard is graded, after plumbing is installed, after the foundation is poured, and so on. Many construction loans are set up to adjust as this process occurs. One form of adjustment is a floating rate. Floating rates are typically set in two parts: one part is the initial interest rate, which does not adjust; the other part is the floating rate, which can go up and down based on the lender's assessment of loan risk. If the lender determines the value is not appreciating fast enough, it can raise the interest rate, giving you incentive to pay down the debt faster. Most construction loans are extended as only a small fraction of the home and lot's total value. For example, if you purchase a $200,000 lot, you may receive only a $100,000 construction loan against that property to get you started. As you continue to raise the value of the property, you can receive more funding. This means you always have an asset on the line that is far more valuable than the cost of your loan. If you default, you lose the asset, as well as the large down payment you personally placed to purchase it. Further, a number of construction loans are non-amoritizing. The goal is to eventually pay off the loan in one lump sum when you receive a new mortgage. 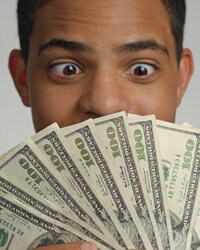 As a result, any debts you pay along the way apply only to keep the interest and financing fees paid off. If you have to abandon the project for any reason, you will have the entire debt looming over you. This debt will also go unpaid if you do not succeed in securing a permanent mortgage once the home is built.